Pest description and damage Adult pine needle sheath miners are silvery moths about 0.5 inch across. 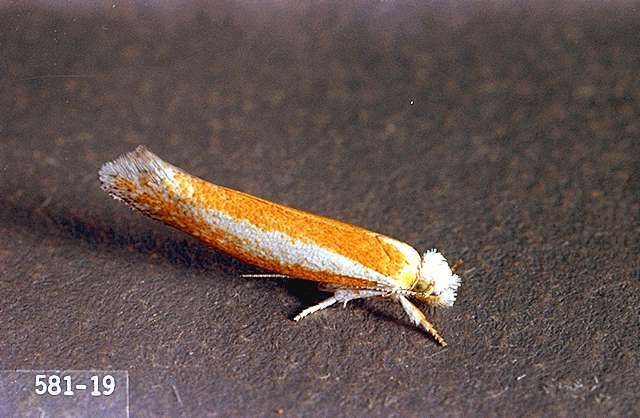 Young larvae are bright orange with a black head. Older larvae are tan-color and 0.5 inch long. Young larvae mine inside needles, while older larvae feed at the base of needles inside the needle sheath. Damaged needles often droop or stick out from the stem at a sharp angle. Pine sheath miners attack species and hybrids of two- and three-needle pines and western white pine; and seem to prefer smaller trees. Biology and life history The insect overwinters as an immature larva within the needle sheath. In spring, feeding resumes and the larva pupates on the shoot tip. Adults lay eggs on needles from early to midsummer. There is one generation per year. 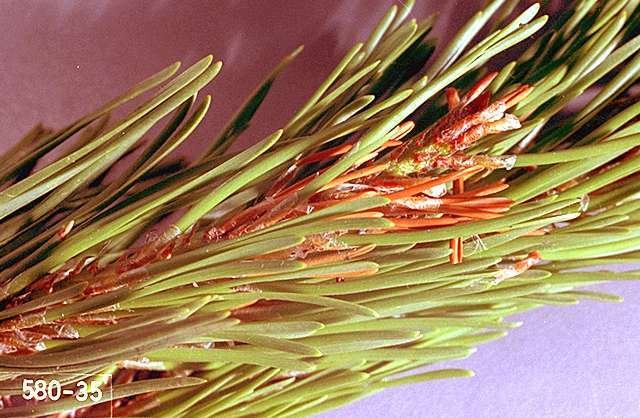 Pest monitoring Look beneath trees for clusters of needles bound together to form a tube, or on branches for needles bound together rather than fanned out. On smaller trees, prune out and destroy heavily infested branch tips or needle clusters in early spring.